Tyrrell 001 was born in 1970, the result of Ken Tyrrell’s need to maintain and further the interest of his relatively recent star driver signing, Jackie Stewart. The Tyrrell/Stewart association. Ken Tyrrell had entered Formula One in 1968 with a Ford Cosworth DFV engine deal and an urgent need for a chassis before managing to sign Stewart. He acquired a Matra MS10 chassis just in time for the start of his debut 1968 season. Prior to this, Stewart had excelled at a Goodwood test in a Tyrrell entered F3 car in 1964 and had driven for Tyrrell in F3 and F2 between 1964 and 1967. In the meantime, he secured a Formula One drive with BRM alongside Graham Hill between 1965 and 1967, gaining valuable experience and winning two Grands Prix along the way. The 1968 Matra MS10 run by Tyrrell and driven by Jackie Stewart with second driver Jean-Pierre Beltoise, won three Grands Prix, closely challenging for the Championship. For 1969, the Matra MS10 was followed by the Cosworth DFV powered Matra MS80, in which Stewart won his first Drivers World Championship. 1970 and the emergence of the Tyrrell 001. For 1970, Ken Tyrrell unable to accept a Matra engine, risked taking his Ford badged DFV engine and became a customer of March running a 701 for Stewart and Francois Cevert. This stop-gap was just enough to keep Jackie interested who won an early Grand Prix in it. Tyrrell knew from the start he couldn’t keep the 1969 World Champion driver’s interest with this inferior car and simply had to build his own Formula One car. Stewart’s faith in Ken was high and they had shook hands on their commitment to each other; starting in February 1970, a new car (SP, Secret Project, later 001) was being secretly designed and built by Derek Gardner at Ken Tyrrell’s request and had its racing debut at the Canadian Grand Prix, running in the last three races of the year with some promise. Derek essentially a transmission engineer for Hobbs and then Ferguson found himself working with Matra on their four-wheel drive 1969 car. On meeting Ken Tyrrell several times, a meeting was set-up after Ken realised how good a designer Derek was and Ken asked Derek ‘do you think you could design a Formula One car’, the rest is history as they say. Tyrrell 001. Thorough research, personal sacrifice and commitment to the highest standards of manufacture characterised Derek Gardner’s approach to SP. The remit was for a simple car which wouldn’t need a lot of development to make it competitive. The bath-tub monocoque was well understood and the aim of the bulbous central monocoque was to ensure a consistent centre of gravity that was low and central in the car even as the fuel was used up, not unlike that of the Matra MS80. The front bulkhead was also MS80-like and forward of this was an unusual blade-like front wing with forward water radiator opening underneath. With Dunlop tyres, running in its first three Grands Prix at the end of 1970, the team knew that despite teething problems, they had a successful car ‘out of the box’…with one pole position and two other front row starts, 001 retired whilst leading in Canada and at Watkins Glen. Whilt running second in Mexico, Stewart later retired 001 after hitting a stray dog, a peculiarly ‘Mexico problem’, not to mention the locals…such was Formula One in 1970. Tyrrell Grand Prix car dynasty begins. In 1971, the prototypical Goodyear shod 001 quickly spawned Tyrrell 002 for Francois Cevert at the opening race at Kyalami and Tyrrell 003 for Jackie Stewart’s on-going use from the Spanish Grand Prix at Monjuich Park. Driving Tyrrells 001 and 003 in 1971, Jackie Stewart won six Grands Prix and the Drivers’ World Championship title. This was a rich reward for Ken Tyrrell’s own managerial skills and his judgement and selection of a first class driver and also one of the finest Grand Prix car designers of the period. …and to the present day. The Tyrrell 001 remains an iconic pugnacious, very purposeful racing car, ‘Tyrrell’ in every way and a great and lasting credit to Derek Gardner. The car has been beautifully restored by Hall and Hall in 2003/4 and raced on loan by American historic racer John Delane (who also owns 002 and the prototype 006 car). After great success on track, the car was repaired and further restored before being returned to the Tyrrell family who still own it. Tyrrell’s 003 and 006 are owned by the Stewart family. Some of the parts from Tamiya’s Tyrrell Ford F1 that I converted to an 001 in 1995 will be incorporated into the definitive Tyrrell 001 model that came from the original Tamiya model, thus ensuring the recycling of parts and enabling it to ‘live on’, reminding me of a generous teacher Nick Crawley and my still good friend Gary McCartan. 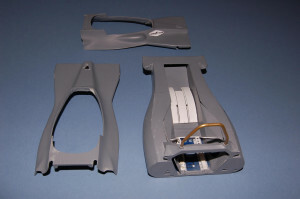 Returning to the conversion of the original generic Tamiya model to an 001 in 1995, this involved converting the nose section to one incorporating the characteristic high, blade-like front wing with underslung water radiator opening venting-out hot air via the rear top surface ahead of the monocoque. 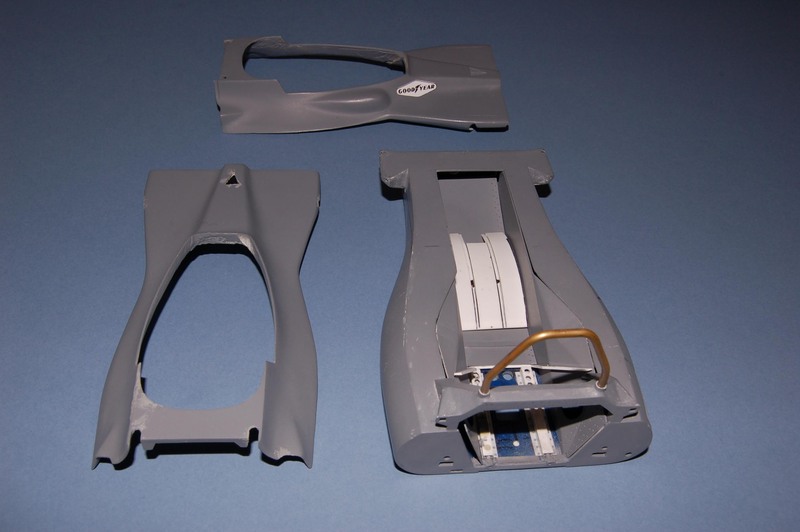 This latter section in the original kit was retained, grafting on a scratch-built full width front wing made from plasticard, filled with a suitable plastic filler of the time. 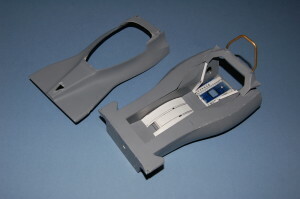 Details within the monocoque were added such as the central fuel filling point ahead of the dashboard. Updated wing mirror supports and rearward bracing of the roll-over bar were characteristic of 001. The rear wing was modified with a central leading-edge cut-out for the forward placement, not far behind the Cosworth DFV carburettor trumpets. This was typical of 1971, the rear wing being moved back in each subsequent year until in 1973 when the rear wing would have been maximally outrigged, restrictions thereafter in place limiting its placement behind the rear axle line. Modifications to the cockpit surround and windscreen further improved the effect. Decals were backdated to that of early 1971, however by necessity, this often meant copying in paper and applying as best I could, nevertheless looking right, especially in photographs. The original decals were soaked off and repositioned where appropriate, rub-on Lettraset being employed for the drivers name etc. Tamiya’s incorrectly narrow monocoque didn’t help, but at the time I would have no idea that this wasn’t accurate, for it wasn’t until 2004 that I would begin to appreciate how different the real cars were when compared to the Tamiya models, which up until that point represented an accurate miniature representation of the real thing. Very nice job. 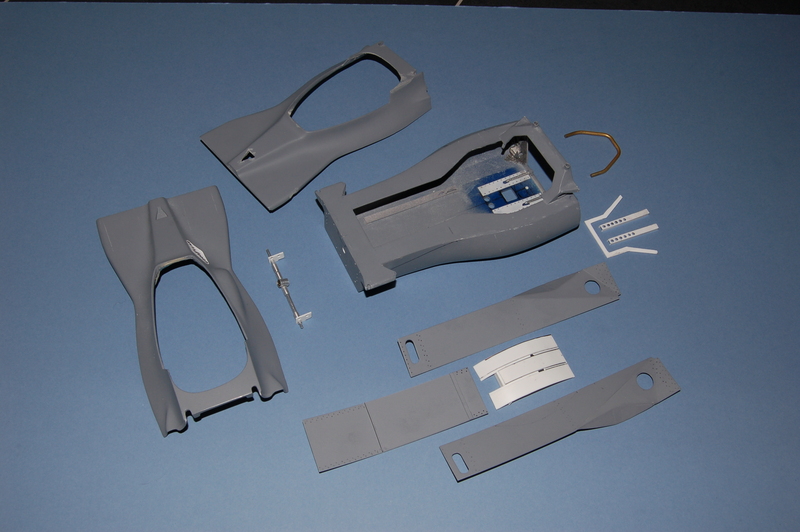 I`m trying to scrachtbuild one in 1/24 scale using styrene 1mm but without good results. It’s wonderful to see you are inspired by the models I have built and if you are thinking of Tyrrell 001 in particular, at that scale you may have to judge the shape and size of the monocoque purely on photos as I am not aware of any other similar model in that scale (1/24). I wish you the best in doing this – not impossible as that is essentially what I did with the Hesketh 308 and the Matra MS10 to some extent. It was only later I toured race preparation workshops and measured-up, but access these days is sometimes limited without owner’s permission. 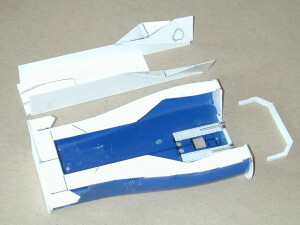 Hopefully, you will complete your Tyrrell 001 (if that is what you are aiming at) before I do! Mine is still in monocoque form, in a box and waiting until I have time to make a re-start. In order to build my 1/12 scale Renault RE30B, I acquired a 1/20 scale kit and carefully scaled it up carefully and enjoyed lots of scratch building using Plasticard (0.25-1mm), Milliput etc. Tamiya have re-released their Tyrrell F1 with an 001-type nose cone in 1/12, which could be a helpful start-point, however there are simplifications and inaccuracies in this larger kit to be aware of.